In GOLIATH AND THE SINS OF BABYLON, the actor on the top left is unknown. In this scene his face is always cut off. He does appear briefly in two other scenes later on but from a distance or in shadows so we never see his face. Can you imagine his disappointment? 'Hey, mom, dad, I'm in this movie and I'm definitely in a couple of shots.' When his entire family and friends go see the film at the movie theatre they can't find him or wonder if that's him. Body wise, I'm trying to figure out if he's a regular PEPLUM actor. It's not Giovanni Cianfriglia that's for sure. For he looks like Armando Bottin from the two last TEN GLADIATORS films but I might be wrong. 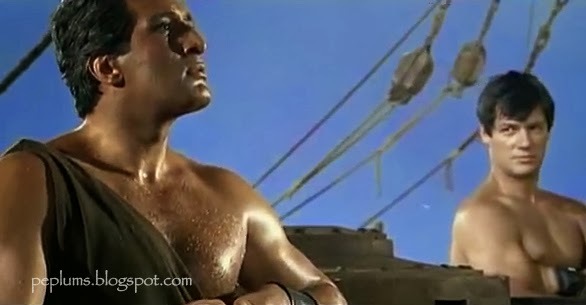 Speaking of TEN GLADIATORS, in a very strange cameo of sorts, we see TEN GLADIATORS star Jeff Cameron, for a split second on the boat before the big sea battle in the same film. It's actually not a cameo as those brief appearances are reserved for well known actors. This was one of Jeff's first appearances so he wasn't famous when he shot this. If you blink you'll miss him. As far as I know he doesn't appear in the remainder of the movie after this brief 'hi...and bye' bit. Mimmo Palmara and Jeff Cameron in GOLIATH AND THE SINS OF BABYLON. Now you see Jeff, now you don't. This actor I have seen in several SW's that I have in my collection, but I'm not sure he goes by that name. I have reason to believe that he's an Italian Actor right or wrong. Are you talking about Jeff Cameron? Yes, he's Italian but 'Jeff Cameron' is his real screen name. Jeff Cameron isn't the only "Ten Gladiators" star to make an appearance in "Goliath and the Sins of Babylon". Dan Vadis also makes a very brief appearance for a second or two about six minutes into the film in a scene that was spliced in from "Colossus of the Arena". And coincidentally, Jeff Cameron makes a brief appearance in "Colossus of the Arena" as a gladiator in the opening arena sequence. 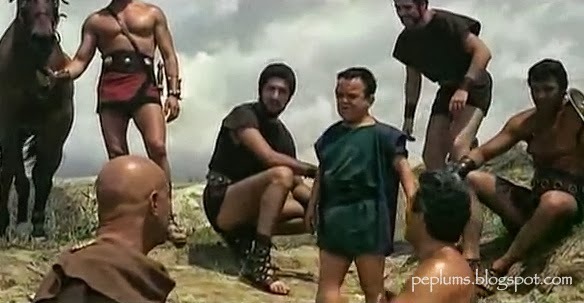 Yes, the Colossus of the Arena scene in Goliath and the Sins of Babylon shows big Dan Vadis.